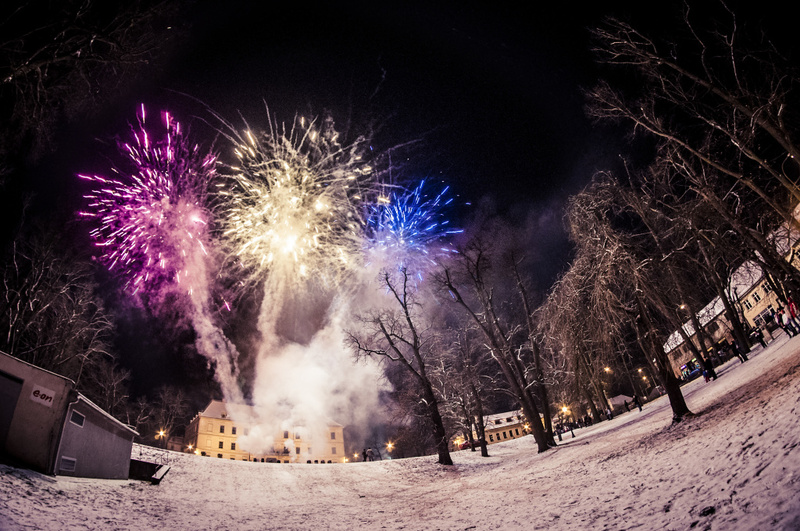 Fireworks aren’t just for New Year’s Eve. You’ll also run into them at large celebrations, lavish weddings, and of course fireworks displays. So you’ll find plenty of chances to photograph these light-shows against unusual backdrops. 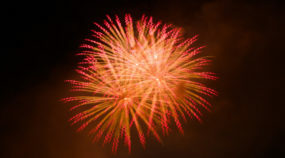 Before you actually head out to photograph the fireworks, check your equipment. After all, there’s less time for the shot than usual, and you won’t get a second chance. What’s worth your attention? Battery – don’t forget to charge it fully; ideally bring a spare as well. Long exposures really put a strain on batteries. Lens Assembly – test it to make sure everything’s working right, and check for smudges on the lenses. They can cause unpleasant “local blurring” in night photography. Remote trigger – if you don’t have a cable trigger, then try your camera’s remote control function. That will need an energy source too, so get some backup batteries. Tripod – check that it’s all right, and attach the tripod quick-release plate to your camera before you leave home. You’ll have trouble fumbling with it in the dark. Beanbag – you’ll do well to take a beanbag for stabilizing your camera with you as well. The spot with the best view isn’t always one that you can place a tripod on. When it’s not, you’ll be able to position your camera better on a beanbag (or a bag filled with rice). From the above you should mostly be able to tell what you should be taking with you to your fireworks shoots. But there’s one other thing: multiple lenses. That’s because you usually won’t know how the fireworks show will be composed. You might need both a wide angle for capturing the whole scene and a long lens for “drawing in” the events in the sky. 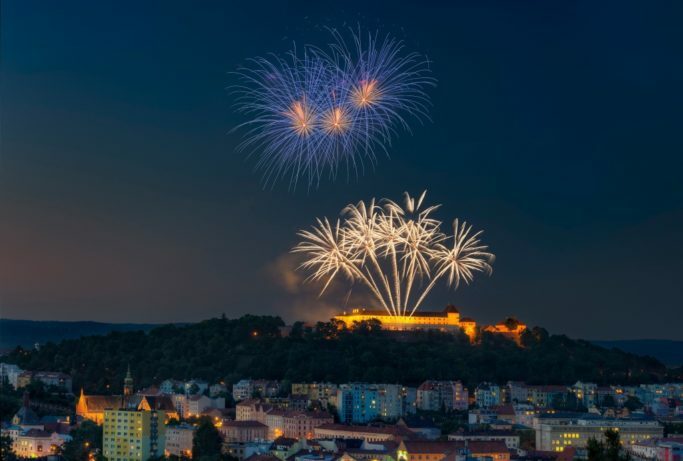 If you can, head to the fireworks site the day before, to find out where the best view will be. Then head to the event in advance to make sure you get that spot. Also keep in mind that as the night goes on, the crowd will thicken. So take precautions to keep your camera safe from getting stolen—or getting knocked off the tripod. 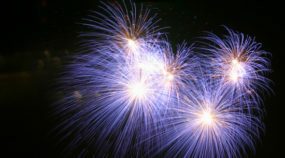 For fireworks photography it’s important that your camera be able to work with manual exposure mode (M). 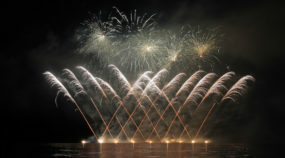 That’s the best mode for fireworks photography. Choose your focus manually as well, because you’ll be focusing to infinity. None of the automated modes would know what to do. Choose your focal length based on the situation. 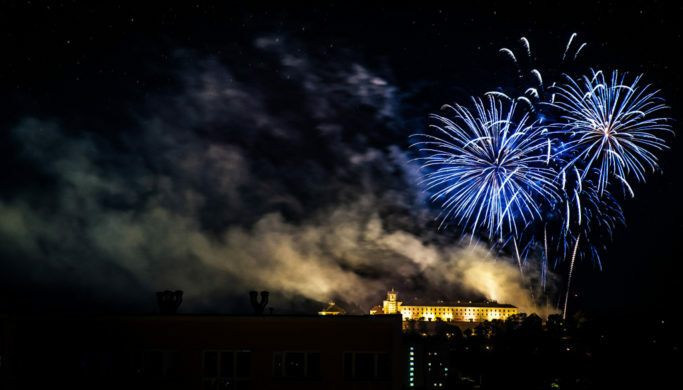 When you’re close to the fireworks and you want to capture the surroundings too, choose a wide-angle lens. If you’re doing close-up shots or you’re far away, choose a focal length such as 50–100mm. For the ideal sharpness, set a medium aperture, roughly in the F5.6–F5.8 range. Using a tripod will also enable you to avoid motion blurring. Choose an ISO low enough to avoid highly visible noise in your pictures. The exact values depend on what your camera will let you do. But thanks to your tripod, you likely won’t have to go higher than an ISO of 400. 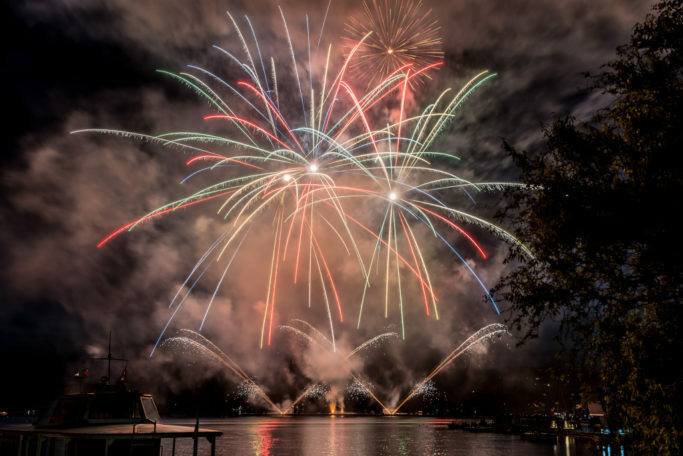 Your exposure time will depend on what kind of fireworks you want to photograph. If it’s too short for them, you’ll only capture a part of the geysers in the sky, but if it’s too long, their patterns will all blur together. Try setting a time from half a second to five seconds, then adjusting it based on your preferences and the pictures you see. Sometimes you may run into a situation where you weren’t expecting to be photographing fireworks. In that case you likely won’t have a tripod with you. But that’s OK. Try shooting without one. However, here you’ll need longer than usual exposures. Set a time of around 1/30 second; anything more and you won’t be able to keep your hands still throughout the shot. Your aperture should be in the 3.5–5.6 range, and your ISO at roughly 1600. 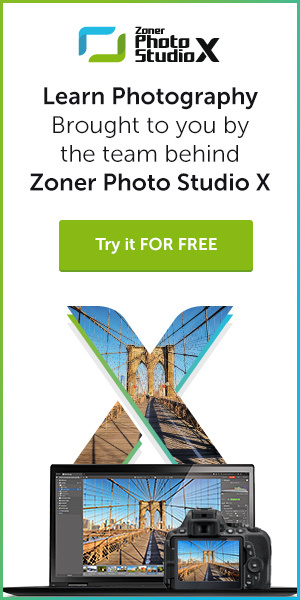 Noise will be highly visible in the black sky, but you’ll be able to suppress it in Zoner Photo Studio. New Year’s Eve fireworks shot by hand. Naturally, photographing fireworks without a tripod isn’t ideal. But when you encounter fireworks unexpectedly, it would be a shame not to photograph them. When you’re photographing fireworks, keep in mind what’s important in the given situation. If they’re a wedding day’s grand finale, then it’s definitely a good idea to also photograph the newlyweds watching them. 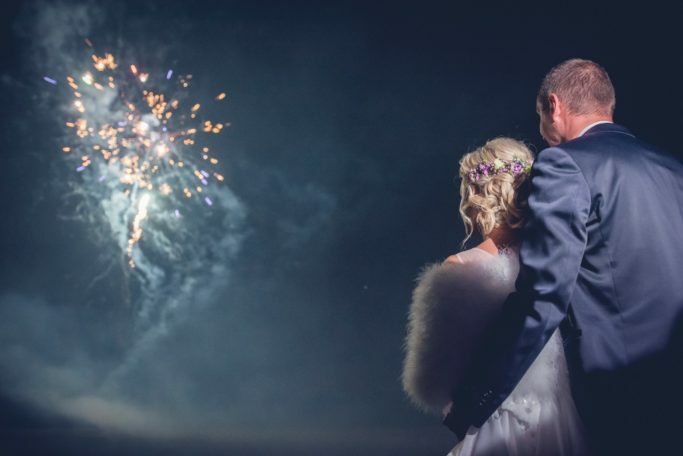 Wedding fireworks with improvised lighting from a phone. Meanwhile it’s all up to you how you play with the composition. 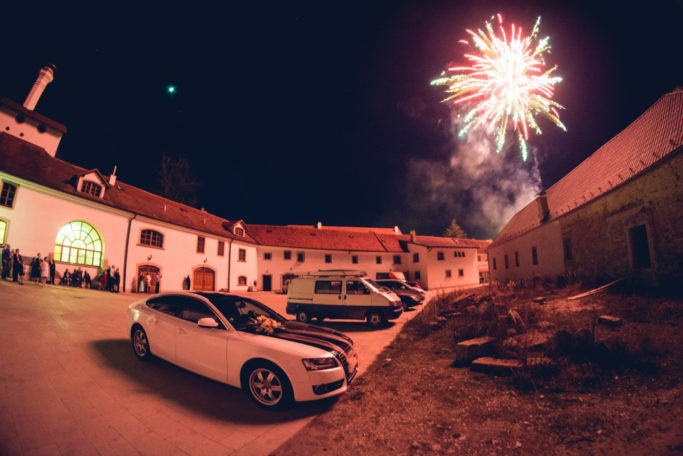 You can compose practically anything into your fireworks pictures—for example a parked wedding car.